Volatil is the coolest hipster wine shop we have in Copenhagen. Lots of great bottles for sale! There’s everything from very easy-to-drink wines to more natural, funky ones with an attitude. The location couldn’t be better for the good people of Vesterbro. The long Boulevard is a brilliant hangout for all kinds of people all year around. It has a lot of cool spots as well, for example Absalon: a church turned into a communal haven, or my own favorite beer bar Fermentoren, among others. These 5 guys haven’t gone all nerdy with only sulfates-free wines. They’d rather go after the principle “if it taste good, drink it!”, a motto that makes sense for me! 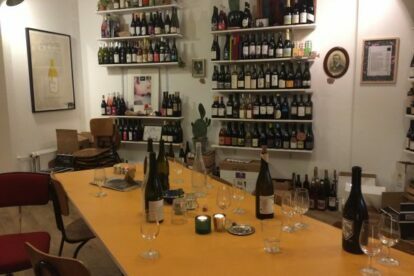 Don’t worry if you feel like you’re lacking knowledge and skills in the world of (natural) wines. The good people of the shop will probably take you through the stories of every bottle there is, if you want to. If you’re lucky, they might also have a few grapes to try out while you’re there!? The picture’s taken after a good tasting and actually shows the coolness and relaxed feeling of the place. It’s not all about selling wines, it’s also about the chats & laughs, the stories about extraordinary farmers doing a good job in producing natural products. The shop is open till pretty late, so that will give you a chance to stop by to buy a few bottles before dinner. I know I’ll be looking forward to visiting more often in the future.